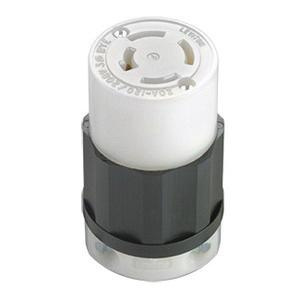 Leviton Black & White® 4-Pole 4-Wire Industrial-grade locking connector accommodates wire of size 14 - 10-AWG. It has cord range of 0.595 - 0.895-Inch. Connector in black/white color, has impact/chemical/abrasion-resistant nylon body and thermoplastic back cover. It has nylon wiring module, cord clamp and clamp insert. It withstands current rating of 20-Amps and voltage rating of 120/208-Volts. Polarized connector with screw terminal connection, has 1-Piece, rivetless 0.035-Inch thick brass contact for optimal conductivity. Connector withstands 2000-Volts dielectric strength per UL498. This 3.78-Inch connector has 1.97-Inch top Dia and 2.22-Inch bottom Dia. It has zinc-plated steel assembly screws for easy installation. It withstands temperature range of -40 to 60 deg C. It has HB flammability rating per UL94 to withstand harsh environmental conditions. 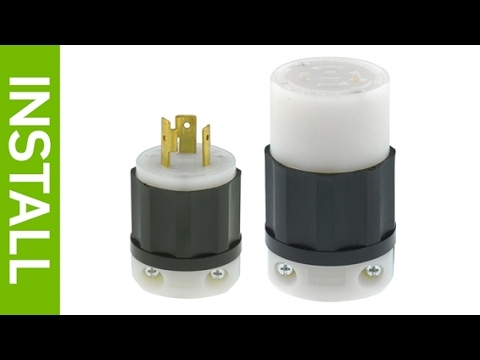 Locking connector is UL listed, CSA/NOM certified and meets ANSI standards.